Hi! 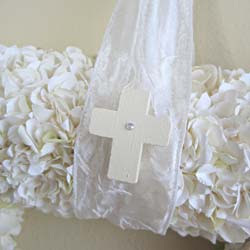 Here's an idea for a fresh Easter / Spring wall accent. Start with a floral wreath. In my example, I used a square paper hydrangea in creamy yellow. I found this little wood cross unfinished at a craft store. I painted it cream and added a simple pearl accent. Then I glued it to a 3 in. wide cream ribbon. Simply loop the ribbon around the top side of the wreath and knot or tie in a bow. Ready for hanging! That's it! A round wreath will work, too. Try a cross pendant made of beads or metals. Choose floral colors and cross style to coordinate with your other decor. 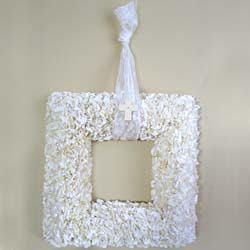 Add a cross to an existing wall accent in your home., like a Spring wreath for your front door. And send me photos! I'd love to see your version of this idea!